Cut the bezel and you've got a machine that is essentially the size of the 11" Air, just a wee bit taller, but closer to the 13" when it comes to productivity. I enjoyed the article, and I’d love that machine too. 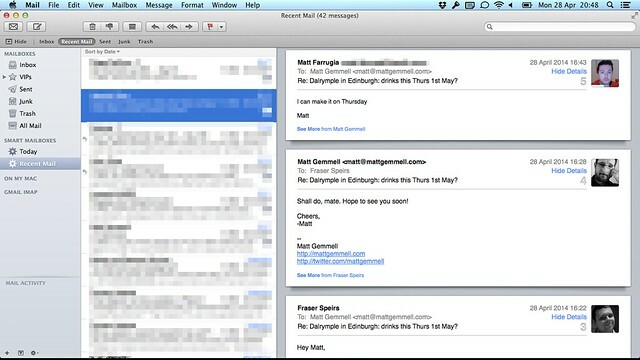 But I have to take issue with the (very common) idea of “productivity” as a consequence of screen size. I’m so close to owning my perfect machine. In all but one respect, I already do: it’s the 11” MacBook Air. I currently have a July 2013 Haswell model (1.7 GHz / 8GB / 128 GB). My perfect machine would be this size, this weight, this incredible battery life (I routinely get 13+ hours on Mavericks), and this apparent screen resolution, but with a Retina display. That’s it. I’ve never been happier with a computer than I am with this one. I also have a 27” iMac with an external 24” screen, graphics tablet, a whole batch of external drives, and so on. I use it during the day at my desk because… it’s there, I suppose. It was excellent when I was writing software since I could have a large Xcode window, and the iOS Simulator on another display. It’s wildly over-powered, even when I was still a developer. I’m probably going to get rid of it. My favourite machine of the two (and all the other Macs around here) by far is the 11” Air. Evenings, weekends, when I’m on the exercise bike, when I’m working elsewhere or travelling, and at various points during the day when I want a change of scenery, I’m on the Air. I’m on it right now. And I’m productive. There’s something comforting about large screens; I’m well aware of that, and I feel it too. The expanse of screen-space hints at creative possibilities. You probably wouldn’t want to do full-time graphics work or app development without a large and/or additional screen, either. You can, but those are specialised disciplines where you can make a strong argument for two-up or even larger displays. For the vast bulk of stuff that most people will want to do on a computer, though, most of the time you don’t need a desktop monster. I don’t think you even need a 15” screen, which is essentially a portable desktop. You just have to use a small screen productively. Let me tell you a bit about how I do that, with some recommendations as to best practices and some utilities you might want to look into. Small screens are radically different from large ones: you have to actually care where stuff goes, and what’s visible. Many apps have window-management features built in, and on an 11” screen, you’ll want to pay attention to them. Here’s how I use a few of my daily apps. In both of these apps, I keep the font size large in the primary editing areas, because that’s what I’m looking at most of the time. The important point is that small screens really benefit from customisation, to get the best use out of them. 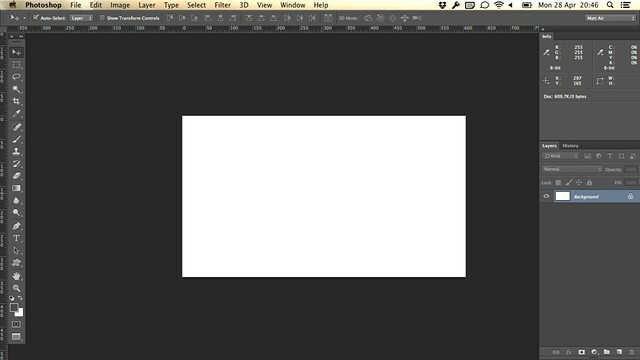 You can see how different the above Photoshop workspace is to the one I use on the 27” iMac. 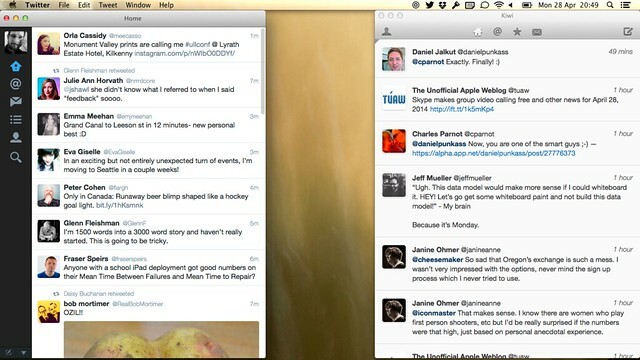 Generally, you’ll also want to consider Full Screen Mode, which is an OS X feature designed primarily for small screens. You regain the vertical space that the menubar (and Dock) normally occupy, and windows gain their own Space, which is what OS X calls a virtual desktop. I think you’d be surprised just how much room you have, even at the 11” Air’s native 1366 x 768 resolution. 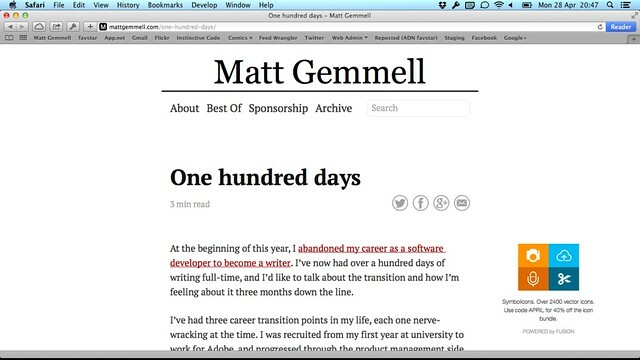 Likewise, Safari shows enormous amounts of space on either side of webpages. Yes, the pages are vertically short, but it’s more than comfortable for reading. I also keep a dedicated Space for social media, where I also reply to iMessages. I always keep my Dock hidden (on all machines), and barely use it anyway. It contains only the apps I launch every day. From left, those are: the Finder, Safari, Mail, Twitter, Kiwi (for App.Net), Adium (which I just use for IRC), ReadKit (RSS feeds), BBEdit, Scrivener, Terminal, Calendar, and Self Control (about which more later). I have a theory about this. I think that small screens are only claustrophobic if you feel you have to physically interact with the space. If you’re mousing around, you can feel the dimensions. The pointer can bounce off the screen edges, and you have a visceral sense of the area available. If you’re using the keyboard efficiently, however, that feeling of being hemmed-in goes out the window. 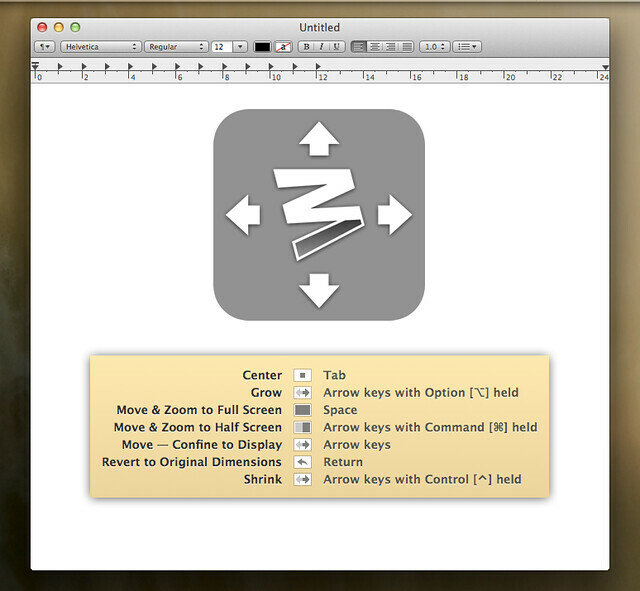 You can flip between apps, Spaces and interface elements without feeling that it’s a spatial movement. You’re just switching UI around. There’s a psychological difference, I’ve found. Knowing your way around the keyboard interface is the single greatest productivity enhancement you can make, on a non-touchscreen device. Any task with a keyboard equivalent (and that’s almost anything) can be triggered more quickly using keystrokes than a pointing device, and without requiring a context switch. All those tiny efficiencies add up quickly. 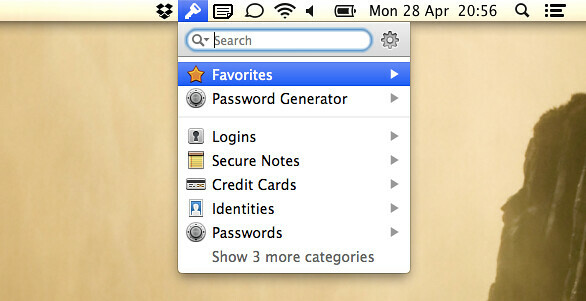 My first piece of advice is to enable Full Keyboard Access in System Preferences’ Keyboard pane (in the Shortcuts tab). Setting it to “All Controls” lets you move the keyboard focus between any kind of interface widget using the Tab key, not just text boxes and lists. It’s amazing what you can do when so much more of the UI is navigable without taking your hands from the keyboard. Note also that the Space key triggers selected non-textual interface elements, like buttons or popup-menus. 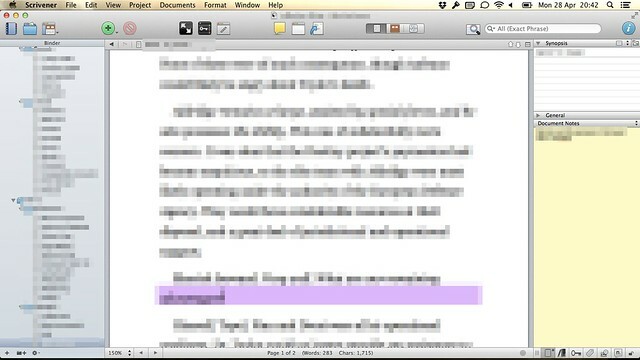 My second piece of advice is to learn your text-editing shortcuts. These can save you hours of painstaking, headache-inducing, wrist-destroying pointer-manipulation. If you’re editing text, you shouldn’t be touching the trackpad or mouse at all. Not for moving the insertion point, not for selecting, not for cutting, copying and pasting, not for scrolling the viewport. Not for looking up the dictionary, or correcting spelling. You don’t need the mouse for any of these things, and you can fly through those tasks by keeping your hands where they should be. Thirdly, get some help from a few useful utilities. I’m going to recommend five of them, which are my day-one must-install set for any new machine. Get yourself an enhanced app-launching and file-manipulation utility. There are lots available, but my favourite is Alfred. It does every conceivable thing, and I use it dozens of times every day. It’s like Spotlight with a hundred additional features, and you can construct your own workflows, global keyboard shortcuts, and even entire features. 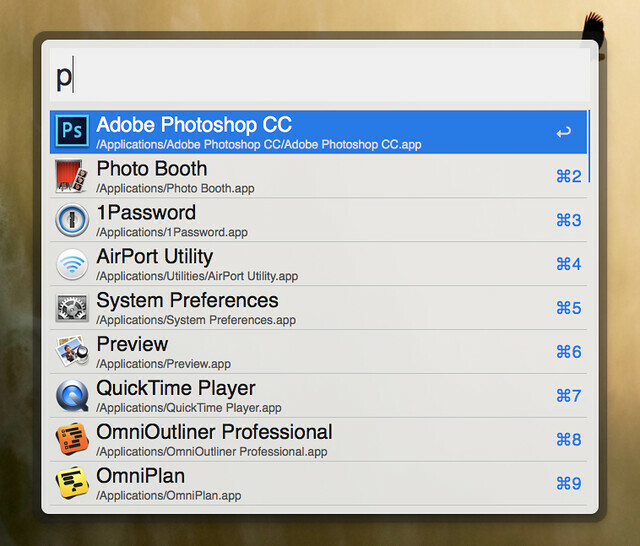 Most importantly, it lets you find, open and act on files and apps without ever touching the trackpad. It’s surprisingly deep. Next, you need something to help you manage windows. Moving and resizing windows is traditionally the job of a pointing device, and it’s a guaranteed route to headaches - particularly if you’re a bit obsessive about things lining up properly, as I am. Again, there are lots of utilities out there, but the one I love is Moom. It lets you move, resize and align windows entirely via the keyboard, and also lets you create custom shortcuts to tile windows in arrangements of your choice. You can move by ten pixels or one pixel, expand and contract windows in any dimension, center or maximise them, or toggle back to their previous size. I miss it immediately on new machines. The next thing you might want is a quick notes utility, and I’m going to shamelessly suggest my own, which makes use of Notification Center (or Growl, if you prefer). It’s called Sticky Notifications, and it does just one thing: it lets you make quick on-screen reminders about things, if you have to suddenly switch tasks, or take a phone call, or walk away from the computer. I use it about twenty times a day. 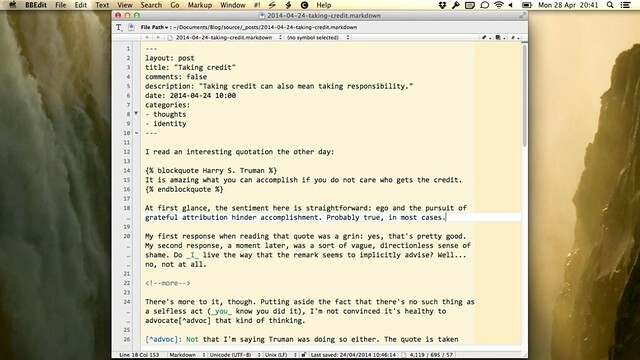 It’s so stupidly simple that it’s exactly what I usually want: just a stack notepad that uses on-screen notifications. You’ll also want a password manager, because the days of being able to reuse passwords (or to have weak passwords) are officially over. Your accounts on popular services will be compromised. It’s only a matter of time. It’s going to happen multiple times per year, and the only sensible policy is to have passwords that are as secure as possible, and are unique for each service. Passwords are also a huge pain to look up, retrieve and use, so you want something that’s controllable completely from the keyboard, and integrates with your other Macs and iOS devices. That’s 1Password. I’m a recent convert, on both platforms. It’s on sale at the moment, and you can use it alongside iCloud keychain quite comfortably. 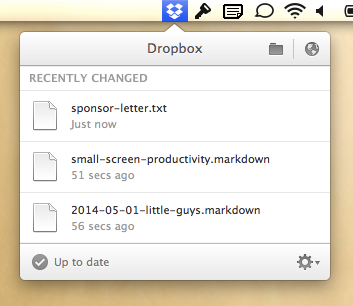 Lastly, I always recommend Dropbox for file sync. It’s not so much keyboard-friendly as just requiring no interaction whatsoever. All of my work lives there, so I don’t have to care what machine I last worked on. That’s a whole class of file-manipulation that I never have to do. Learning and using keyboard shortcuts is by far the biggest (and easiest) productivity gain available, no matter what size of screen you’re using, but they really come into their own on small-screen devices where the entire interface is visible without substantially moving your gaze. As has been true for decades, if you’re not proficient with keyboard navigation and shortcuts, you don’t have a valid position on boosting productivity on your computer. I have one last simple piece of advice: force yourself to work. I use Self Control to block access to social media, shopping sites, online comics, news and RSS feeds for appropriate amounts of time, and my productivity skyrockets. I’d advise setting it for two hours, and seeing what you can accomplish. Ultimately, productivity is a symbiotic relationship between humans and tools. Your device is what you make it.